Excited for our next conference?! We are too! We're answering some of your most pressing questions below. 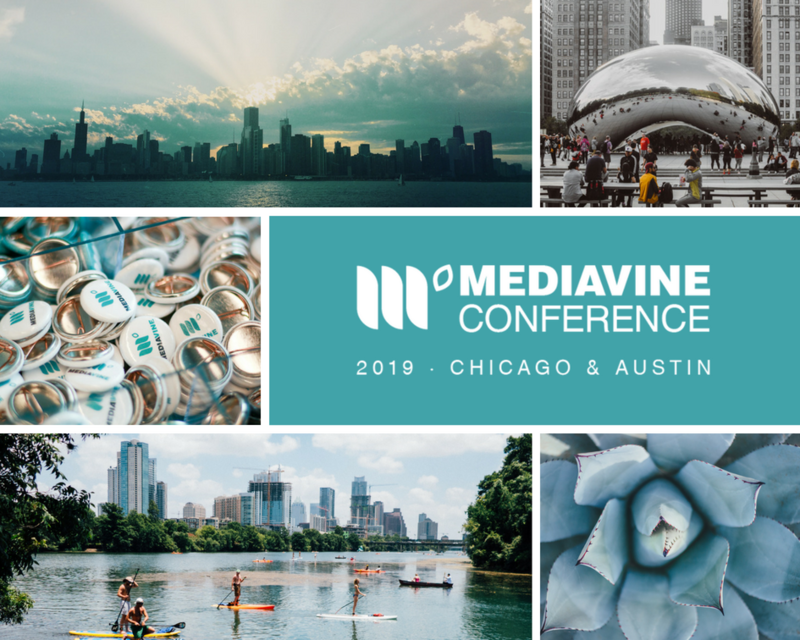 When and where is the 2019 Mediavine Conference? Do you have a conference Facebook group? Yes! Check it out here. It’s open to Mediavine Conference attendees only, and we’ll accept new members once 2019 tickets go on sale. All-access tickets for the Chicago event are sold out. Dinner-only and brand tickets are still available here. Austin conference tickets will go on sale in three stages. For each stage, a portion of tickets will be reserved for those who have not attended a Mediavine conference in the past. A total of 200 tickets are available. Visit our Austin conference page to purchase tickets. How do I book my hotel at the group rate? Once you purchase your conference ticket, you’ll get an email confirmation from Eventbrite that includes the special link and code for booking. We do encourage room sharing in order to ensure enough rooms for all attendees at this discounted rate! Please email megan@mediavine.com for all refund requests. May 1, 2019 is the last day to get a refund for the Chicago conference and Oct. 1, 2019 is the last day for refunds for the Austin conference. Tickets are limited to 2 per person, while Newbie tickets are limited to 1 per person. If you are buying tickets for another person, you will need to be able to fill out all of the associated questions, including but not limited to address, phone number, dietary restrictions and social reach. We will not be opening the waitlist until Stage 3 of ticket sales. Once a ticket type is sold out at Stage 3, a waitlist will automatically open. Fill out the waitlist form on Eventbrite. If a ticket becomes available, you will receive an email from Eventbrite. You will have 24 hours to purchase the ticket. If you do not purchase the ticket in time, it will be re-released to the next person in line. Topics will be similar between different conferences, but with different speakers/strategies. Check out our YouTube Channel to see some of our past sessions and speakers. You can view our current speaker lineup on the conference website. If you’re interested in potentially speaking at our Austin conference, please email Conference Organizer Megan Myers at megan@mediavine.com with your detailed pitch. We are currently seeking sponsors for our 2019 conferences. If you’re interested in sponsoring one or both of our conferences, or know of a sponsor who we’d love to work with, please email Director of Influencer Marketing Stephie Predmore at stephie@mediavine.com. Do I need to be a Mediavine publisher to attend? No, you do not need to be a Mediavine publisher to attend our events! We love sharing information, and whether you aren’t at the session threshold or are with another advertising company, we’d love to have you! Blogging/business partner? Yes! Please buy two full conference tickets if you would like your business partner to attend sessions with you. Significant other? Yes! They’ll probably like a dinner-only ticket. Child? In order to maintain a focused atmosphere for all conference attendees, we ask that you leave your little ones at home. If you do need to make arrangements for a mother’s room, please let us know when purchasing your ticket.